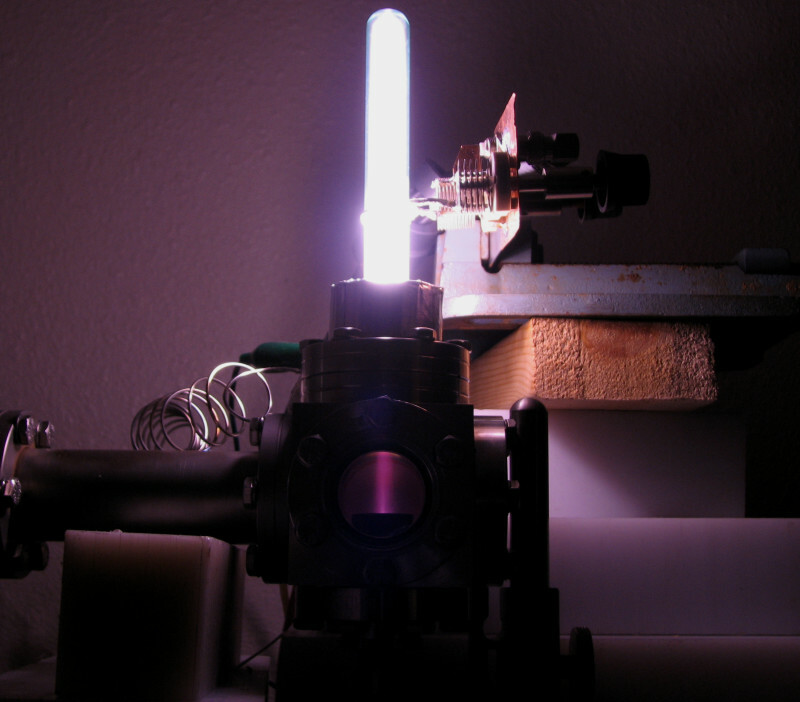 I have been working on an ion source to support my next fusor and other small accelerator projects. Criteria for this source were that it had to be easy and inexpensive to fabricate myself with common components from reliable sources. My goals were to obtain high beam current and long service lifetime. 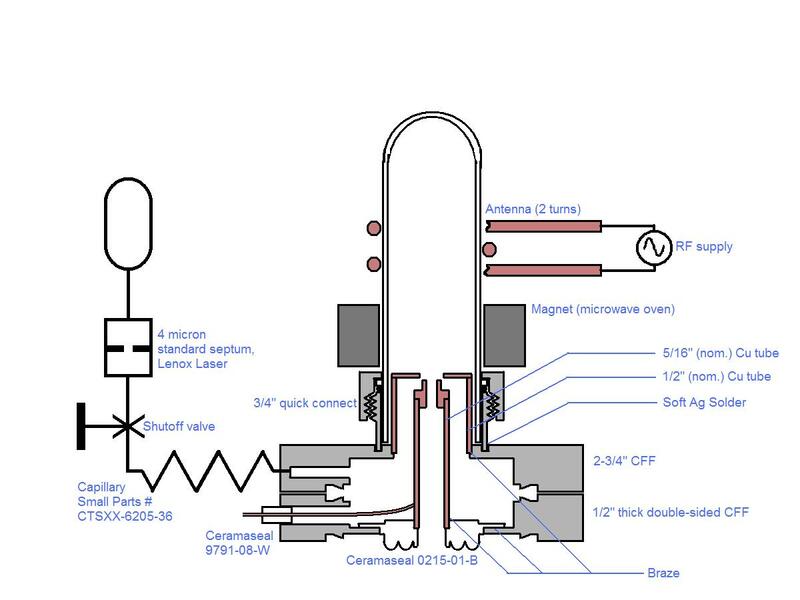 I settled on an RF ion source concept with specific influences from Kiss and Koltay (1977). 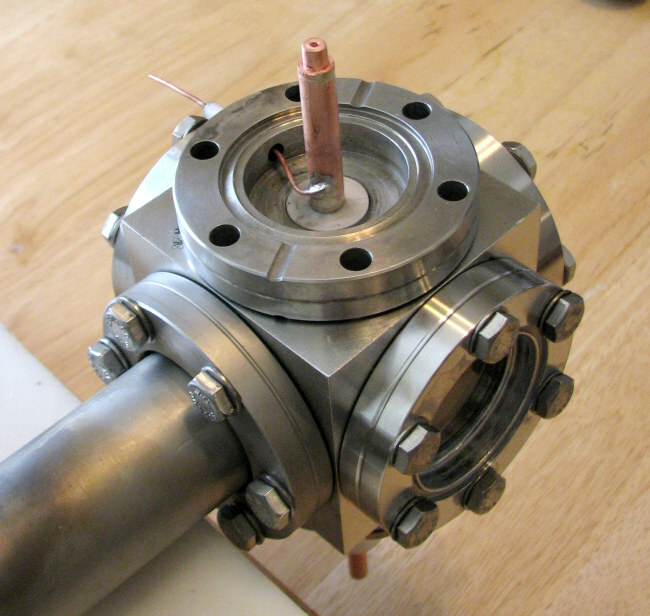 Tests of the prototype indicate stable sub-milliampere currents of deuterium ions over hours of operation. Cost (excluding RF and vacuum equipment): about $250. RF ion sources function by extracting ions from radiofrequency electrodeless discharges. These sources can deliver high-purity beams of atomic H+ ions. 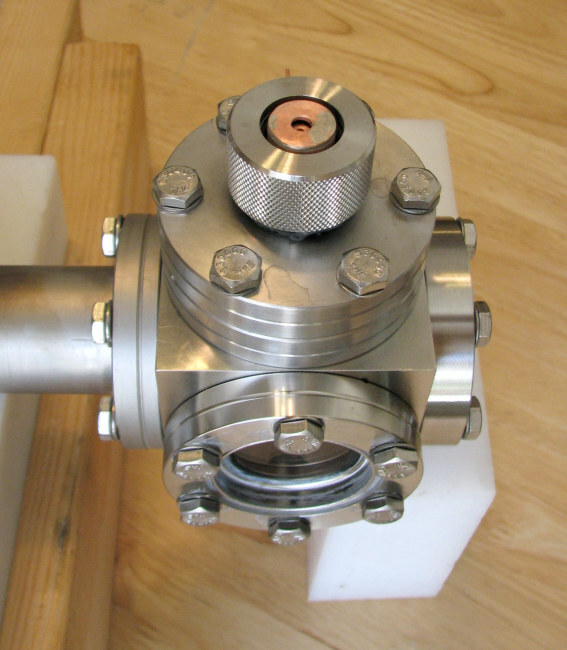 The vessel supporting such a discharge can be as simple as a glass test tube surrounded by an inductive coupling to the RF supply, as my design at left illustrates. The discharge is “enhanced” with the field from a strong magnet. Some builders attempt to exploit specific enhancement effects, e.g. electron cyclotron resonance or helicon phenomena. My goal with the magnet is just to promote generic electron trapping / heating, possibly by the above-mentioned modes if conditions are appropriate. Components, with suppliers’ names and stock numbers, are provided in the drawing. Construction techniques involve drilling, lathe turning, silver brazing, and soft silver soldering. 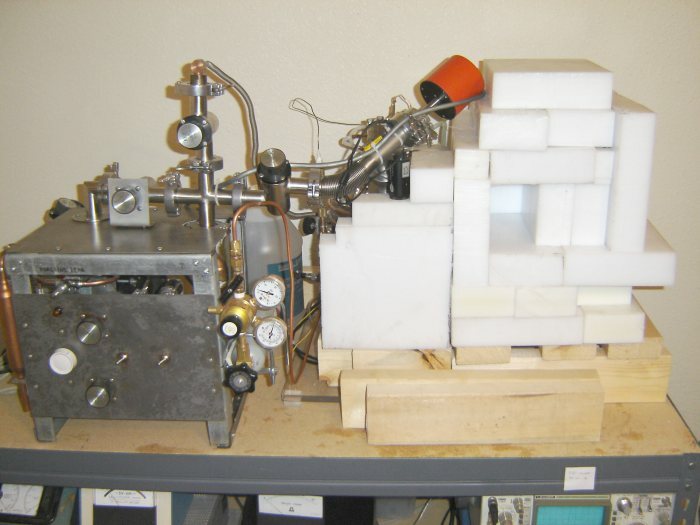 Photos at left show components of the source (most prominent are the extraction electrodes) during assembly on a ConFlat cube for testing. 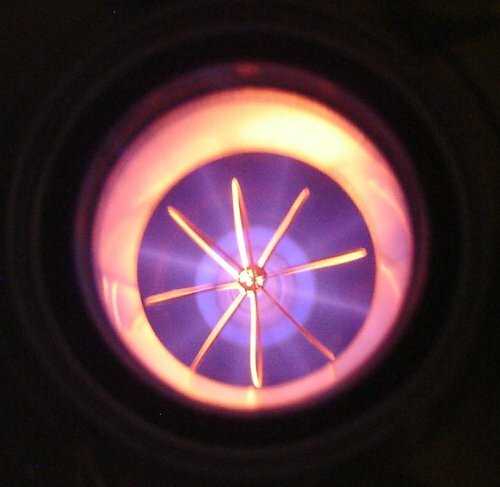 Extraction of ions is accomplished by a strong DC electric field imposed between the negatively-biased “nozzle” on the 5/16″ tube and the grounded septum on the 1/2″ tube. I use up to -5 kV for extraction of ions. 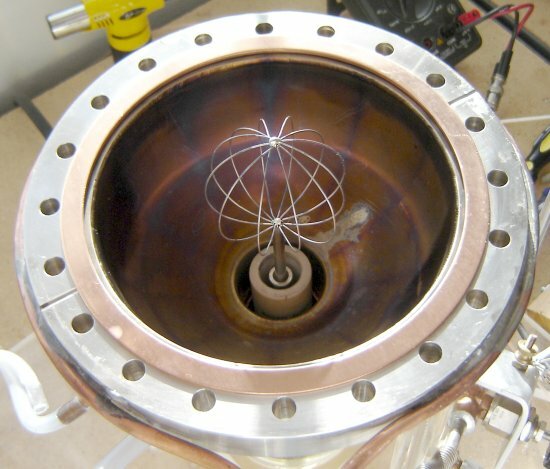 The extraction nozzle also throttles neutral gas flow from the discharge region into the vacuum chamber. 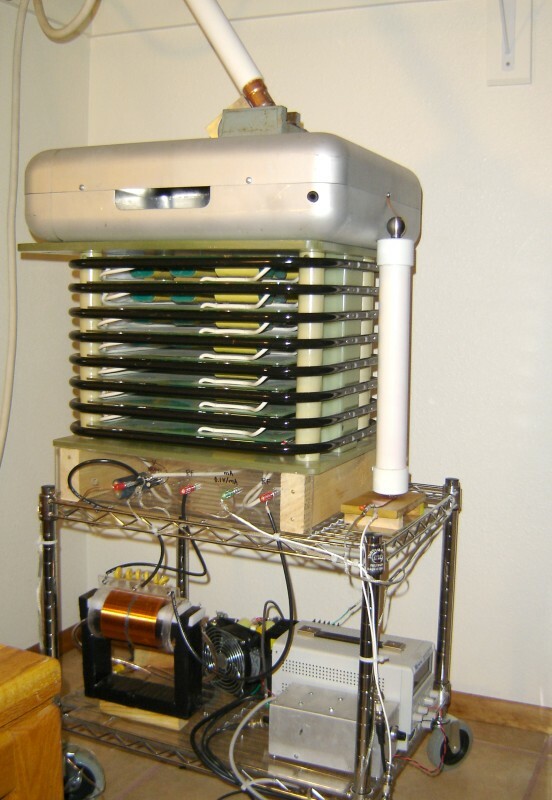 RF power is supplied by an FAA-surplus AM-6155 power amplifier operating at 200 MHz. These amplifiers are a common hamfest bargain. Circuit details and modifications for the amateur radio hobby are easy to find online. To date I have not produced more than ~60W with this amplifier, driving it with signals below 1W. Beam current depends very strongly on RF power, and I plan to upgrade the driver for the AM-6155 to produce more. The top photo shows this amplifier producing power (lighting a mercury-vapor discharge), and the bottom photo shows the tube compartment of the amplifier modified for shunt feed of plate current. 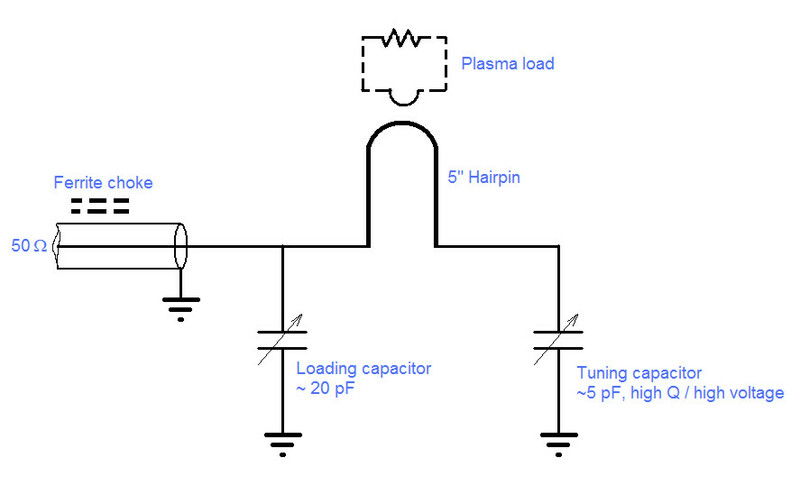 Inductive coupling of the 200-MHz power to the discharge plasma is effected with a single loop of heavy conductor that forms part of a resonant “L-match” circuit, providing an easy interface to 50-Ω cable. This is illustrated schematically at left. 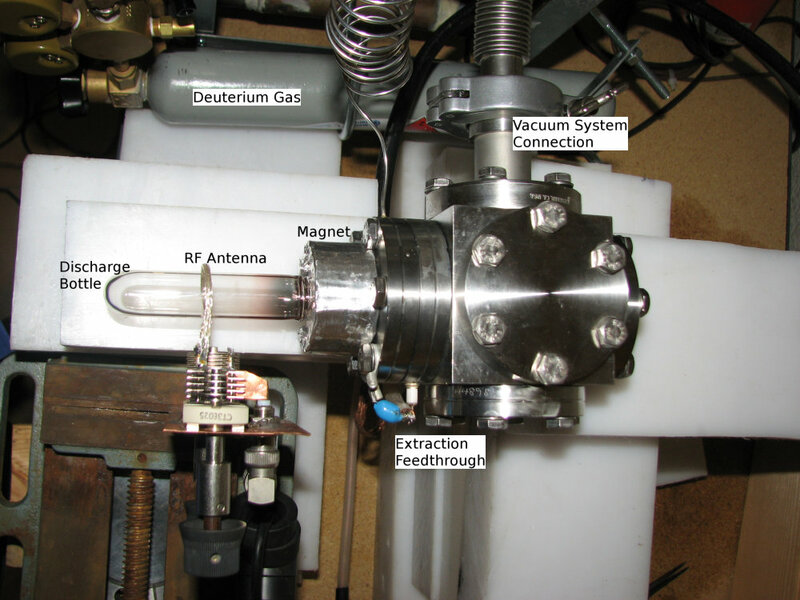 The right photo shows the ion source ready for testing, with the RF coupling loop visible along with other components including gas for the discharge (deuterium lecture bottle). Photos from operation. The top photo shows the RF deuterium discharge in a standard 19-mm (3/4″) Pyrex test tube, and below it a beam of extracted ions impinging on a graphite Faraday cup target. RF power is about 50W, extraction voltage -3 kV, and target at -10 kV. Background pressure has been raised into the millitorr range to enhance beam visibility. Extracted current is 0.25 milliampere. 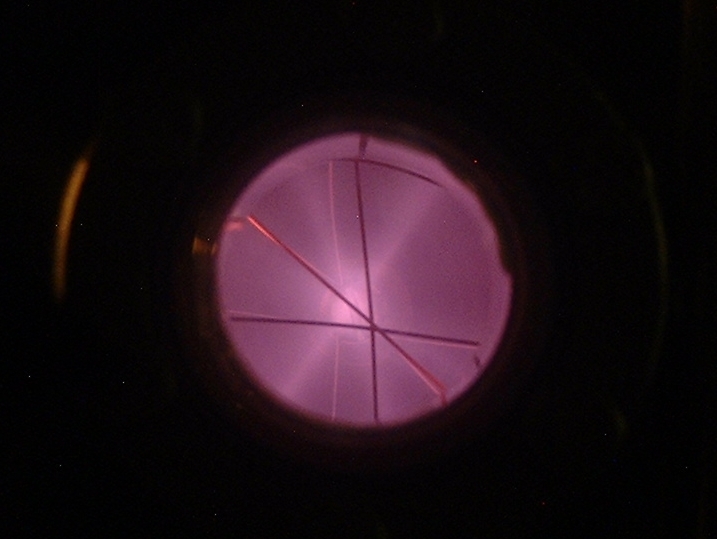 Bottom photo shows the exit aperture clearly, with deuteron beam passing through a ring electrode at -10 kV. 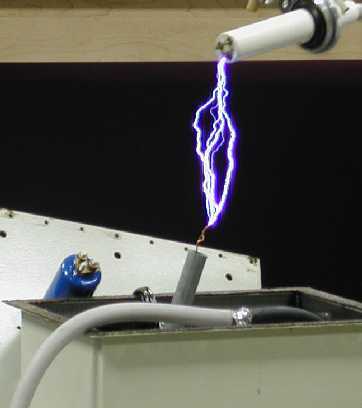 Here the extraction voltage was -5 kV. It is not possible to accurately measure the beam current in this arrangement, but it is probably on the order of 0.5 mA. Not surprisingly, a few neutrons from 2H(d,n) fusion reactions can be detected with higher potentials on the ring cathode. 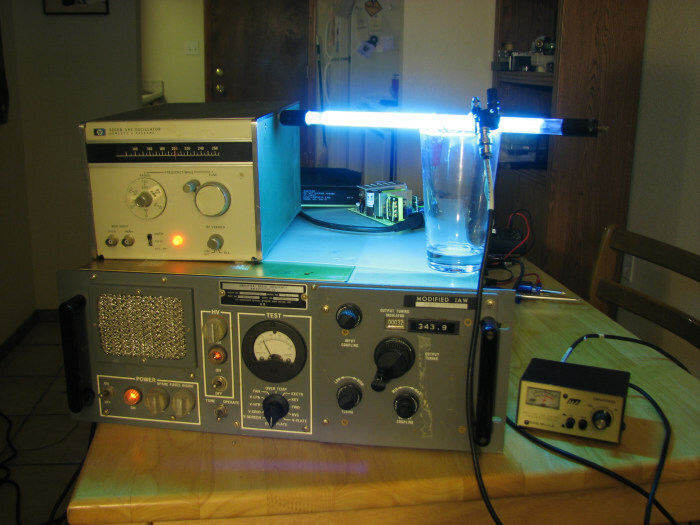 This post will serve as a documentation hub for my Farnsworth fusor hobby projects. I have used these devices as neutron generators for doing activation experiments at home and at college. 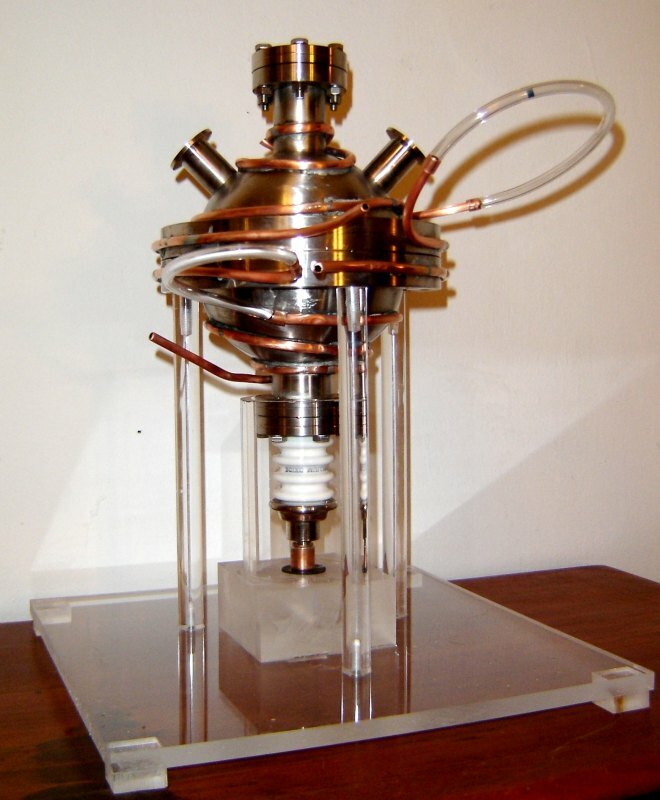 The fusor is a simple spherical ion source / accelerator / collider that can be built on a shoestring budget with a minimum of technical background, enabling hobbyists to access some nuclear fusion reactions. 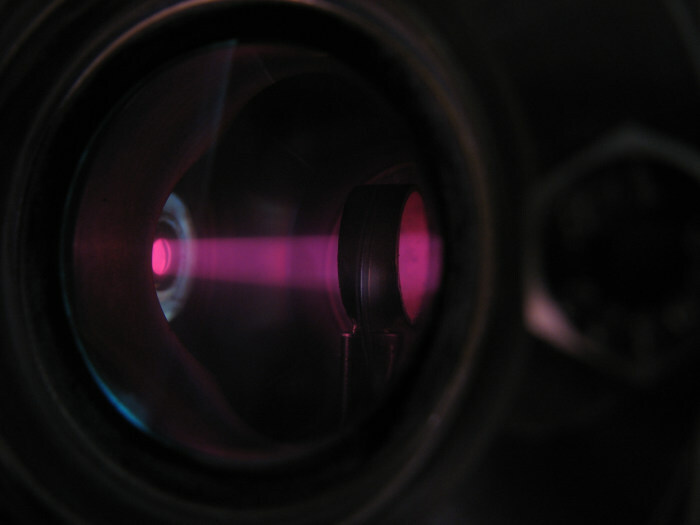 This blog post isn’t intended to provide an adequate overview of the fusor’s physics or serve as a base for technical discussion–there are already some good websites out there with those purposes. Readers with questions or interest in this technology are encouraged to engage in the discussions on the Fusor Forum. 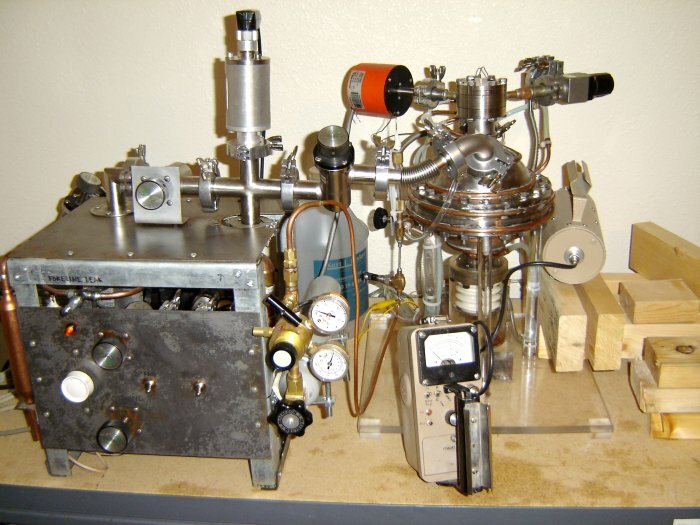 “Carl’s Jr.” is my current fusor project, first operated in 2006. Specifications of “Carl’s Jr.” are provided below, with links to more detail and commercial suppliers for some components. Typical operating conditions: 75 kVDC, 12 mA, 12 mtorr, > 2E+06 neutrons / sec. 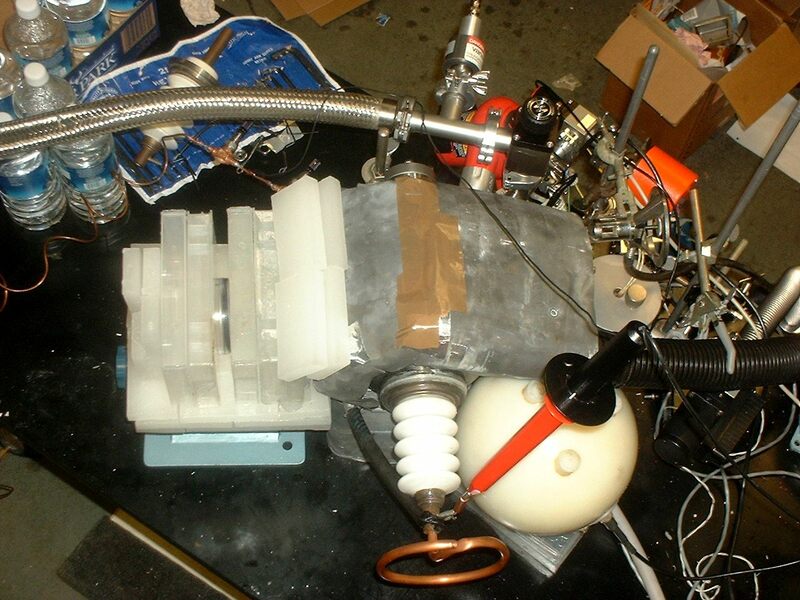 While a student at Guilford College, I built the predecessor to Carl’s Jr., a larger but less innovative fusor with which I did some novel neutron activation experiments. Specifications of my Guilford fusor are provided below. Typical operating conditions: 67 kVp, 15 mA, 10 mtorr, ~3E+06 neutrons / sec. My undergraduate thesis for the physics department of Guilford College, entitled “Neutron Activation Using a Farnsworth Fusor” (2003) can be downloaded here. An accompanying PowerPoint presentation can be downloaded here.